Now, to be clear, this doesn’t go back all that far. 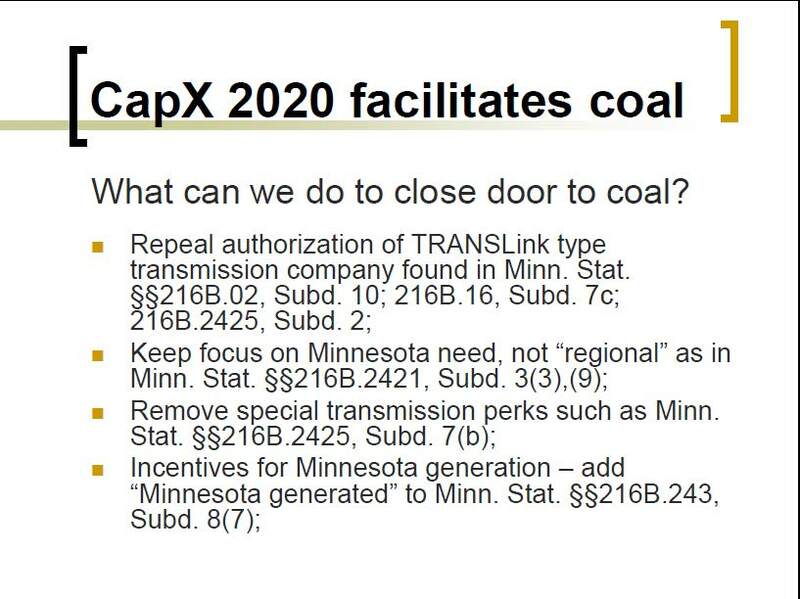 But I’ve been doing some research, omphaloskepsis perhaps, digging back aways into transmission, looking at where we are given the status of CapX 2020 transmission these days, and I’ve been finding details I’d forgotten about, explanations of how we got here with CapX 2020 transmission going up across the state. There are gems here and there and some things posted before that bear repeating. 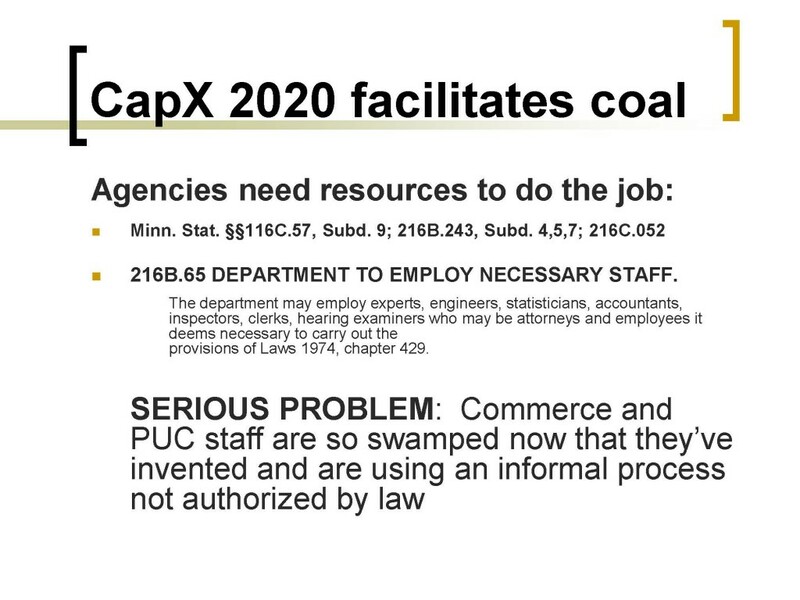 Here’s one, a presentation that House Energy Chair gave the “Hilty Jilty” and wouldn’t allow the Committee to hear. Gee, I wonder why? Simple, huh… particularly if we’re looking to reduce CO2 generation. Will federal policymakers and regulators force states in our region into a catch–22, compelling us to stand down public opposition to economic projects or default to federal backstop authority? I realize that electricity is binary, but why is this framed this way? Comments welcome as to the meaning of that sentence! Good news from our friends the Minars, of Cedar Summit Farms — “Buy the Farm” is in the House Ag Omnibus Bill! I’m calling about the Environment and Ag Omnibus Finance Bill. As a member of the conference committee, I urge you to include language that restores the original intent of the “Buy the Farm” law. This is about justice. Family farmers didn’t have a choice about the CapX 2020 high voltage lines cutting across their land — it was forced upon them. 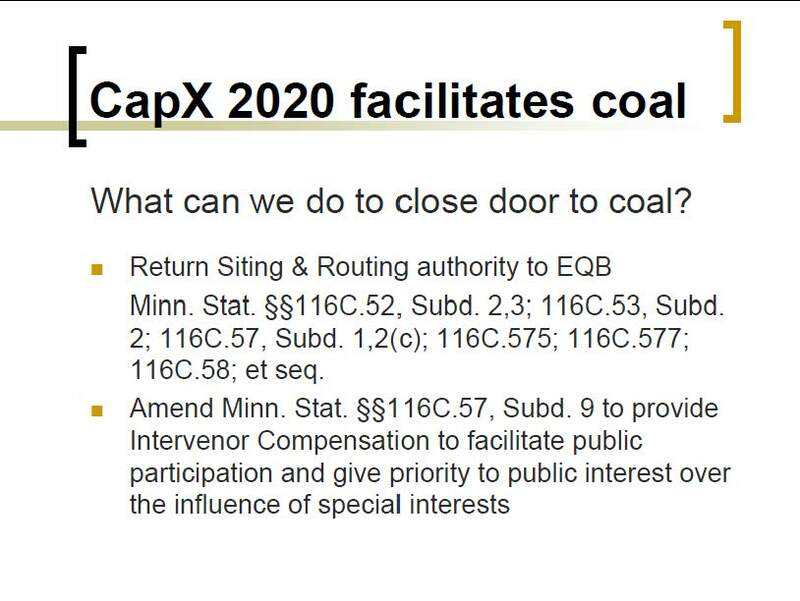 The provisions in section 52 of the House bill would require that a utility taking land from farmers and landowners as part of the CapX transmission project to fully and promptly reimburse them for their land, and pay relocation expenses and lost business. Please include these provisions in the final version of the bill. It’s time for corporations to pay their fair share to landowners carrying the burden of transmission lines. OK, I’ve sent mine — it’s your turn! How did this happen? Somebody’s sleeping at the switch! I forgot to post the link for the 2012 Earnings Call transcript from Seeking Alpha! And it’s a doozy. You can find the FULL TRANSCRIPT HERE. A few questions on behalf of Angie Storozynski. First question is you talked quite a bit qualitatively about the load growth expectations, but can you give us the number that you’re expecting for 2013 and in the long term? Sure. I mean, in terms of 2013, maybe if I just talk about it by operating company. We’re — for NSP-Minnesota, we’re looking at a decrease of about 1.2%, NSP-Wisconsin expected to be flat. In Colorado, just under 1%, actually, that’s more about 0.6%. And in Colorado — I mean, excuse me, and in Texas, over — just around 3%, I would say. So overall, we expect it to come in between up to 0.5% on a consolidated basis. XEL Earnings Call, January 31, 2013. Well, everything — overall, on the residential side, it’s safe to say everything is pretty flat. So then you move to the C&I side, and actually, the strongest C&I growth was in Wisconsin this year, followed by Texas, I think, followed by Colorado, which had small growth. And then we were — we didn’t grow at all in Minnesota for a number of reasons. That said, the economy definitely saw some signs of improvement in 2012. Housing permits were up. Job growth was better than the national average. Unemployment was equal to or better than the national average. So I think the economies are in decent shape across all our jurisdictions. Doesn’t necessarily mean it translates to high sales growth. And that’s consistent with our forecast. I mean, we’re not anticipating that we’re going to see a tremendous rebound in sales, even as the economies start to improve. I mean, I think, that’s our new normal, frankly. Northern States Power 10-K (2012). Those are numbers I like to see. Hollydale Application, p. 42-48; 50-57; see also 12, 14, 35, 38; see also Table 2 and Table 3, p. 48-49. Xcel’s “Hollydale Need Addendum,” dated January 24, 2013, exacerbates this error claiming a 1.8% growth rate and using a 1.8% growth projection for its forecasts. Michlig Direct, Schedule 2, Hollydale Need Addendum, p. 24. For the full Hollydale docket, go HERE and search for CoN Docket 12-113 or Routing Docket 11-152. 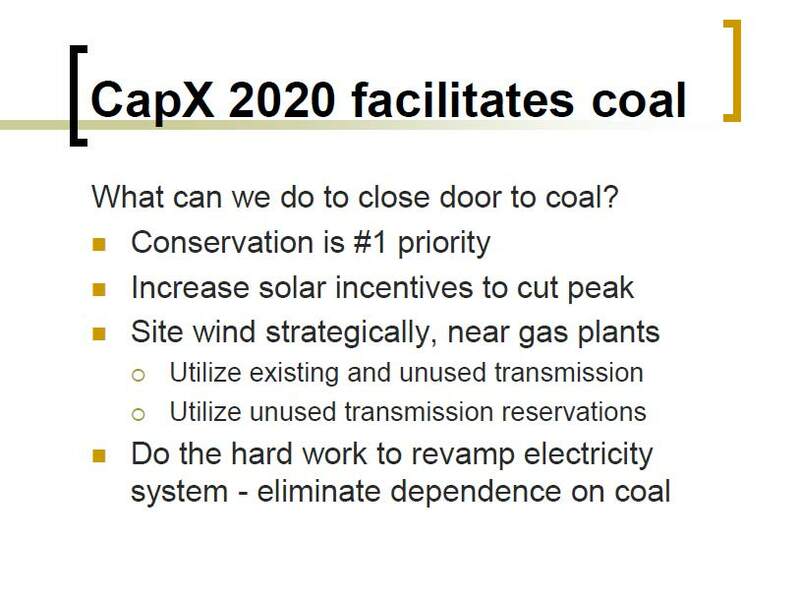 Remember the 2.49% annual increase of peak demand that CapX 2020 is based on? What would this “Percent Load Growth Over Time” chart look like with a -1.2% and no expected improvement for the foreseeable future? To see the entire docket and all the filings go to FERC Library and search for docket EL13-49. And for all the Answer and Comments and Interventions, go HERE!